Recently I finished reading an excellent book titled, “Mind Gym: An Athlete's Guide to Inner Excellence” by Gary Mack. For the hypersensitive side of me, this is exactly what I needed to calm my nerves as I'm still at the beginnings of the exciting journey of flat track roller derby. The mental strength that it takes to succeed at sports is sometimes overlooked or maybe it’s just not up front in conversation. The negative stigma surrounding mental illness in our culture doesn’t help either. Great athletes are perceived as strong and fearless so any sign of weakness is undesirable, something I didn’t want to show. Hiding fears and anxieties can only last so long. What happens when you get hurt? How do you handle not feeling lesser than? “Mind Gym” is full of anecdotes, and if you choose to read it I’m sure you’ll find your favorites. The concept that is hitting home the most for me is self-imposed pressure. I imagine there are a lot of high achievers in roller derby. Every practice I see the dedication and tenacity of my teammates. Striving to be good, or even perfect, is a lot of pressure. 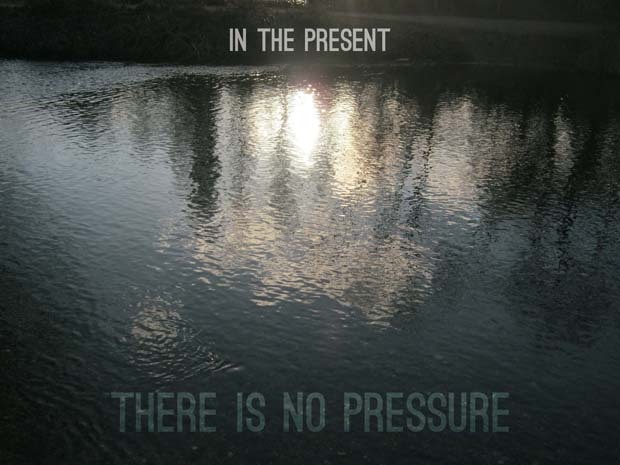 When the book addressed the human tendency to live in the past and future, I started repeating this mantra, “In the present, there is no pressure.” Maybe it would be better if I said “In the present, all is well.” I created this graphic for my work cubicle as a friendly reminder. It’s challenging to put this idea into action, but even more so when you’re hurt and sitting on the sidelines. Last Thursday when my sciatic nerve stopped me from skating, I panicked. Sucked into my own internal vortex, I started thinking the worst. But staying there won’t get you out. Pulling myself together I carefully watched my team play. I would choose one skater to focus on throughout a jam, pretending I was doing the movements. That night I learned things that I couldn’t have while in the action. It was inspiring to see how awesome everyone played, especially my fellow new girls. No longer was this rolling recruitment. This was the real deal. Observing from the outside made me really proud of my team and that I was a part of it. It was also extremely frustrating not being able to skate. I wanted to get in there and join the fun! But maybe this lesson of patience and being kind to myself is just what I need. One of the things that attracted me to roller derby was the supportive community. I am reminded of this when receiving help and support from my team regarding my injury. There is no need to go into the vortex and separate myself but rather further the partnership between me and the team. Until I’m back on the track, I’ll graciously accept this support and partner up with my mind and body too. I’ve often heard that roller derby is more of a competition with oneself than with anyone else. Yet too easily we can fall into the trap of being our own worst enemies. So, if you are anything like me it might be time to ease up and treat yourself well.